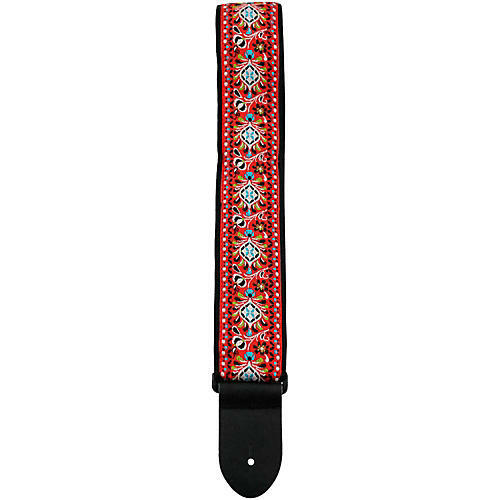 Perri's 2" Premium Jaquard Weaved on Webbing Backing Guitar Strap Red Floral 2 in. Silver Metallic Brocade Crosses 2.5 in. Black with Silver Dots 2 in. Black, White, and Orange 2 in. Perri's 2" wide strap has an adjustable length of 39" to 58" and is made with a yellow, tan and white jaquard design with with a weaved on webbing backing. Perri's leathers are one of the leading manufacturers of guitar, sax, and bass straps. Their straps are made from a selection of durable materials and many feature high-resolution images of rock icons and pop-culture favorites. There's bound to be one to suit your style preference.